Gracious! The internet here at the new house is unbearably slow. It takes me ages upon ages to get videos to upload. And, because they take up so much bandwidth while uploading, I only try to get them up overnight while we sleep and are not going to be online. Even still, a 12 minute video takes ALL NIGHT and then a few more hours in the morning (if I'm lucky). It's kinda infuriating, but a good practice in patience. You may remember some of the Altered Playing Cards I've made in the past for August, for April, and for several other months as part of swaps. Well, I've continued to make and swap the cards and even recorded my process for most of them. So now, I'm desperately trying to edit and upload the videos to share. I'm way behind and the delay in upload time doesn't help any. 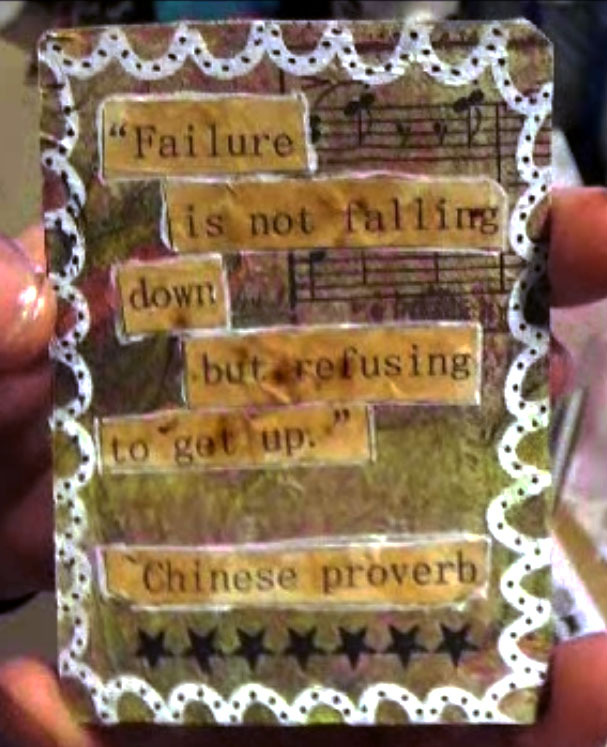 In any case, I finally finished getting October's Motivational Altered Playing Cards videos online. Here's the first of the videos with an explanation and the first card. You can find the second video with cards 2-4 and the third one with cards 5 & 6 on YouTube. If you don't have that kind of time, here are the cards I created for my partner. The quality of the pictures isn't great because I forgot to take actual pictures of them. Instead, I took screen shots of the videos. Sorry. Again, this has all been a great way for me to learn some patience. Here's the first card. 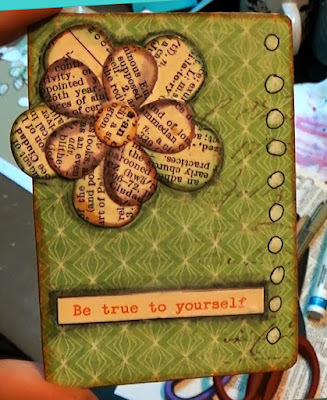 The flower took so long to assemble, but the background was just scrapbook paper and the words a sticker. 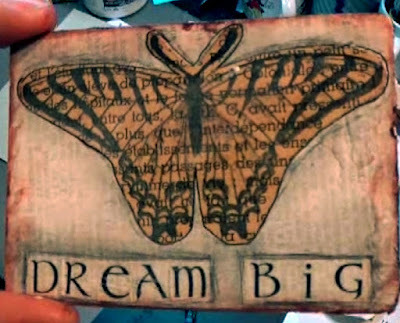 Card number two focused on a butterfly stamped onto some old book text. The words were formed with letter stickers. This third card was way less complicated than it looks. 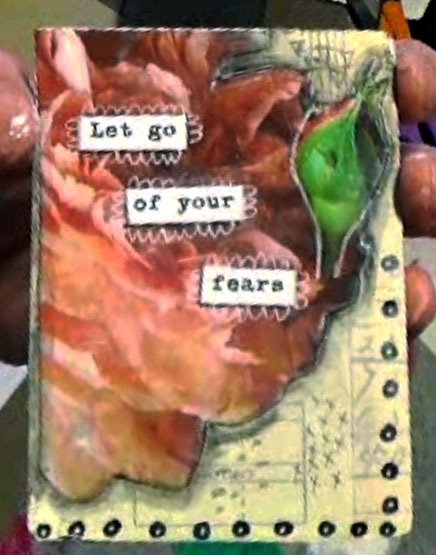 Vintage paper, rose image from a book, text stickers, and some doodling brought it all together. This fourth card is definitely my least favorite of the bunch. The napkin background just muddied the whole thing. I tried to lighten it up with the white doodles around the outside, but I don't think that helped much. The words were printed on copy paper and colored with instant coffee. Because of that, the card smells amazing. What? I love coffee! This is another card that could have been so much better if I had just left well enough alone. 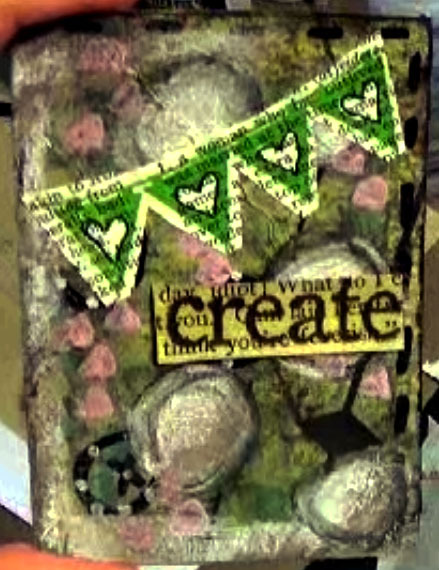 I really liked the gelli print I used initially, but I just kept adding over the top of it until you couldn't even see it anymore. What a disaster! I do like the banner and 'create' that ended up on there, but the background could have been better. For the last one of the bunch, I tried to keep it simple rather than the muddled mess the previous two had become. It's some painted paper with a painted stencil and spray ink. 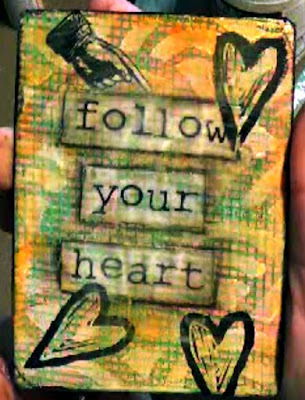 The words are a sticker, the hand is a rub-on, and the hearts are hand-carved stamps. Easy! I really loved the first three I made in this set, but the last three had me trying to do too much and really just about ruining the cards. 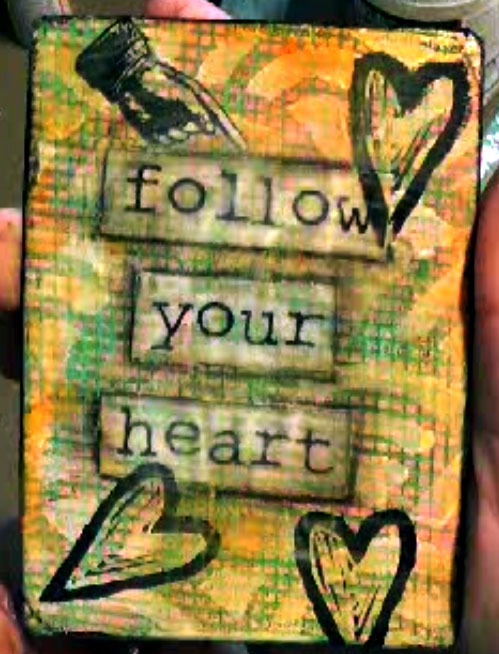 I'm working on learning when to stop in my mixed media process. These are a great example of why I need to learn it. I do hope my partner liked the cards in the end though. I am working on uploading, editing, and voicing the cards for November. Keep your eye out! Please don't hesitate to let me know if you have any questions about these cards. I'll do my best to answer them! I like the first three cards as well. Looks like fun! Sorry about the internet. We have cable internet with one of the highest speeds available. It's not so cheap, but we need it because we watch our TV through a Roku plus Megan sometimes does livestreaming while she draws. Are there other internet services available in your area you can try? Yes, playing with the paint and all is so much fun! As for the internet. . .we have the only option we know about in this area. I guess it one of the downfalls of moving to the 'country'. We didn't have this problem when we lived in town. Right now, we can't even watch the Apple TV in the living room - it won't connect since the modem is all the way in the bedroom. Gah! At least it's nice and quiet and there's five acres. I just have to hope that better service gets out here at some point! I love your altered playing cards. So many ways to make them. They are all fun Hope! The first 3 are really lovely and so professional looking! I love them. I have the same problem with continuing to futz with things when I should try to keep it simple. There is always no rush on making art. The fact that you are doing it is what matters, and your outcomes on these cards is great! I LOVE them all! Kudos to you!